End of money tomorrow is the same as the end of slavery yesterday. Profiters lose, everyone else wins, and the world has as then, one big problem less. The money is running out of time. Changes of the climate, resource scarcity, destroyed environment, social unrest, overpopulation, mass migration of economic and environmental refugees as well as social changes are problems that we cannot solve with money. They can only be solved by a global society of mutual trust, unity and cooperation – the ecohumanist society. 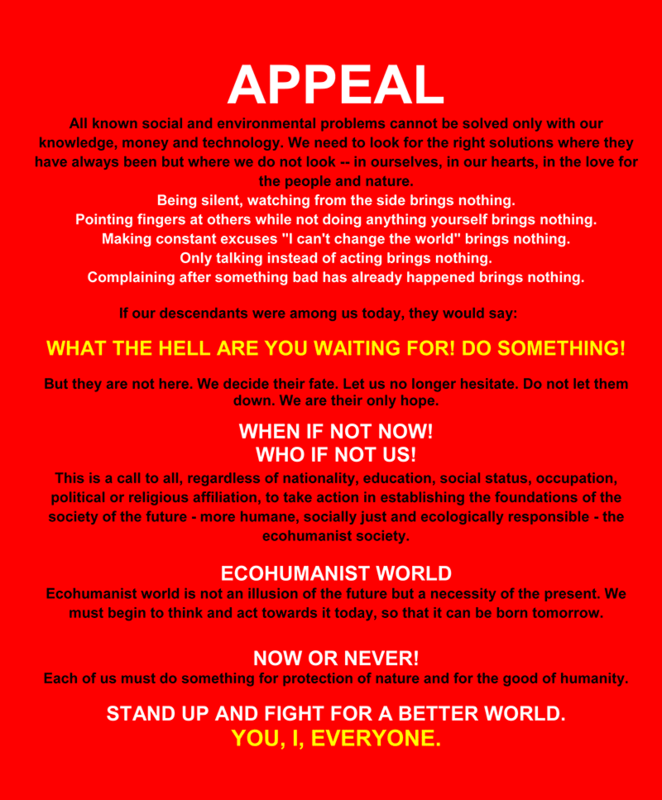 With the abolition of money as payment for their work or service, sales or purchases, experienced ecohumaneist society unimagined social recovery, and provides the individual enormous opportunities for personal development. How does the ecohumanistist society evaluate the work of an individual? It doesn’t pay with money, it awards him with time that fulfills his life with peace, social stability, clean environment, content and satisfaction. The process how to abolish money. To be able to abolish the money as a currency and to begin with the process of the construction of a society without money, untimely social activities must be carried out at global level, that enable enforce this much needed reform. Resistance and intimidation of those who benefit from rule of money most, will be very intense. They are even prepared to start a global war, only to keep the world as it is. But it needs to change, because with the emergence of the new world, everyone benefits. restructuring of the insurance institutions in civil protection, environmental protection and animal welfare institutions. adoption of a single world language. implementation of the equitable distribution of natural and man-made goods. 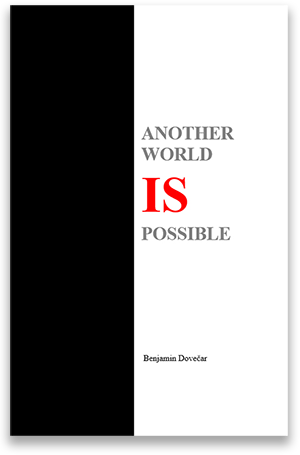 After the year 2100 – the abolition of money and country borders and forming the planetary society. How does a world without money work? A world without money is like a charity institution “ME FOR YOU, YOU FOR ME, EVERYONE FOR EVERYONE”, simple, honest and efficient. This is a revolving system of giving and receiving with a single goal for everybody to win. A surgeon operates a patient. That’s his job for which he doesn’t receive any payment. After all, he doesn’t need it because he doesn’t have any expenses on his own. Everything he needs for his work, education and living is freely available to him. However, all his medical equipment and instruments for operating and future treatment are available free of charge. Everything is given to him to do his job with quality and satisfaction. What about the patient? He is given free treatment because the entire healthcare system is free. If he was a farmer, for instance, then he would make sure that his produce was freely available to the entire society and thus indirectly to the surgeon. It’s very clear: the surgeon helps the farmer, the farmer helps the surgeon, and both of them help everyone else, and everyone else helps both of them. All for one, one for all, a closed circle of solidarity. The entire system of giving and receiving is based on collegiality, solidarity, trust, honesty and unity.